An elegant and polished cookware set is hard to resist. Again, cooking with high-quality kitchen tools guarantees perfect results. The Cooks Standard NC-00391 Classic Stainless-Steel Cookware Set can restore your cooking greatness and make your home-made meals even wonderful! This cooking set is designed to allow cooking with stove, gas and electric cookers. It has a high end appearance despite the affordable price. Having this set in your kitchen improves the value and looks of your kitchen. For optimum cook, the Cooks Standard set includes an aluminum disk at the bottom for quick heat conduction; this makes it work perfectly well even in minimal heat. Cooking can be a great experience when you have the right set that meets your needs; Cooks Standard Classic Cookware is a perfect solution for quality and yummy dishes. It is a great pleasure to cook even the most complicated meals or boil water for a five-minute egg. It doesn’t matter what the menu reads, you can prepare delicious meals that leave everybody in the family happy and satisfied. 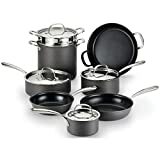 The set includes 1.5-quart covered saucepan, 10-inch open skillet, 3-quart covered saucepan, 6-quart covered stockpot, 5-quart covered deep saute pan with handle and a universal steamer insert with a cover. This is a technology that keeps the handle cooler and very comfortable to grip when cooking. This reduces chances of burns as a result of hot handles. The set can be used with stove, electricity, ceramic top and gas. The pieces are oven safe, but the glass lid is unsuitable for use in the oven. The steel finish is very easy to clean after use, leaving the set shiny; this brings envy to visitors who come to visit your home for a delicious meal. The stainless steel makes the cookware very attractive in the kitchen. The material is also durable for long-term use in the kitchen. The impact bonding technology uses an aluminum disc on the bottom of the cookware to provide even distribution of heat. The aluminum is sandwiched between stainless steel layers so it does not come into contact with your food. Preparation of foods that require different temperatures is achieved for best results. The Cooks Standard NC-00391 Classic Stainless-Steel Cookware set is very safe to clean using a dishwasher for a great look after cooking. If you do not want any food to stick on the pans or pots, allow them to get hot before putting your food. This ensures that no food sticks to the surface hence easy to clean. Q: Where is the cookware set made? A: It is made in China; you can check the stamp at the bottom. I love the set because it is of high quality and performs incredibly well in my kitchen. Q: Is it okay to clean them using steel wool? A: My husband bought the set as my birthday present eight months ago. I use steel to clean the pans and the pot. They are of high quality and very sturdy. Q: Is the aluminum bottom sandwiched between the stainless steel? I do not want to buy a set where the aluminum is in direct contact with the food. A: Yes, it is sandwiched between the stainless steel. This makes the cookware a perfect kitchen companion. Even cooking the most complicated dishes gets pleasurable with this cookware set. 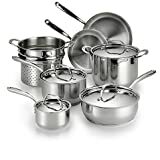 The Cooks Standard set is popular among most high-class restaurant kitchens. This is because of its high performance that makes it dependable. Its impact bonding technology for even heat distribution and the air-flow property that keeps the handle cooler makes the cookware set preferable for a wide range of use.